DUE TO RECENT PROBLEMS, ABSOLUTELY NO !!! ZERO FEEDBACK BUYERS CAN BID ON MY AUCTION WITHOUT CONTACTING ME FIRST !!! THIS IS PART OF THE UK BIGGEST MUSIC PUBLISHING COMPANY RECORD LIBRARY, OF PROMOS / DEMOS / ACETATES, THIS IS ONE OF THE MOST AMAZING COLLECTION OF SINGLES I HAVE EVER SEEN AND I WILL BE LISTING IT OVER THE NEXT FEW YEARS, THERE ARE MANY NEVER SEEN, OR RARELY SEEN PROG / PSYCH / FREAKBEAT / MOD / BEAT / DANCER / NORTHERN SOUL / ROCK 'N' ROLL / POPCORN / FOLK DEMOS / PROMOS AND ACETATES !!! AND ALL IN AMAZING CONDITION. PLEASE KEEP WATCHING MY AUCTIONS OVER THE NEXT FEW MONTHS AS I HAVE A FEW NEVER SEEN AND RARELY SEEN IN DEMAND ITEMS TO COME UP FOR SALE !!! THANKS. This is a RARE ORIGINAL UK DEMO PROMO PRESSING - NORTHERN SOUL single by THE CHANTS from 1968, ORIGINAL UK PROMO PRESSING IN NEAR MINT CONDITION !!! 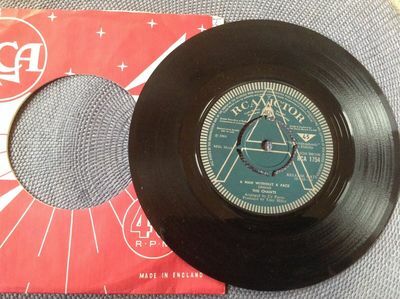 This is a RARE AND GREAT - NORTHERN SOUL - PROMO single that RARELY comes up for sale in this GREAT CONDITION !!! This single is in HIGH DEMAND and this is the ONE OF THE FIRST MINT DEMO PROMO I have ever seen coming up for sale !!! It was comped on the: BRITISH SOUL 1 compilation !!! The tracks are: A MAN WITHOUT A FACE / BABY I DON’T NEED YOUR LOVE. The single came out on RCA VICTOR RECORDS catalogue number RCA 1754. The condition of the vinyl is in MINT- condition (LOOKS UNPLAYED, or maybe PLAYED ONCE ONLY !!! ) + ORIGINAL COMPANY SLEEVE (with writing on it) !!! AFTER A FEW PROBLEMS ALL ITEMS OVER £20.00 WILL HAVE TO BE SENT REGISTERED / INSURED AT AN EXTRA COST OF £1.50 (UK), £5.20 (REST OF THE WORLD) NO EXCEPTIONS !!! REGISTERED INSURED post is going to be required on items over £20.00 at an extra cost. ALL PARCELS TO ITALY WILL REQUIRE REGISTERED / INSURED POST !!! There is NO reserve on this item considering it's rarity. All records are sent in hard cardboard boxes with extra padding, and VINYL is taken out of the PICTURE SLEEVE !! !